Volleyball Blocking Skills - How to Block in Volleyball? Volleyball blocking skills - How to block? Explore simple volleyball blocking skills tips, which help you to direct the ball down to the opponent's court. Do you block balls just barely out of bounce when you are on the right of left side? One of the best tips I have ever received when blocking on the left or right side is – to make sure your toes point slightly inside to the court when landing. Just very slightly – you hardly notice it. It means you have turned your body just a little bit toward "inside the court" when you are up in the air. 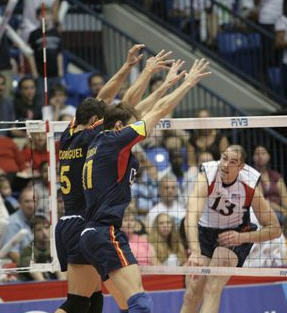 In the picture: Volleyball Blocking. Turning Inside. By turning your body inside the blocked balls start turning inside the court. How to Place the Volleyball Block? Generally speaking when blocking on the right side or left side you should place your outer arm in front of the ball. Of course it is just a general rule – you may want to adjust the block some inches inside or outside depending of the hitter and hitter’s favorite swings. 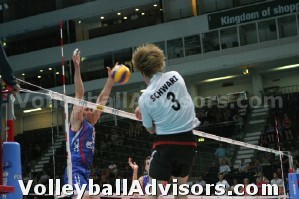 The starting positions of the blockers depends on the volleyball blocking strategy. Left and right side players start inside the court, then with a couple of longer steps and a “swing block” they move simultaneously with the middle blocker to block the left side or right side hitter. Or alternatively outside blockers help the middle blocker to stop the opponent’s middle hitters. This "starting inside"- strategy is usually used by top volleyball teams – it requires a lot from the left and right side blockers, therefore it is for very advanced players. Left and right side players start closer to the antennas. 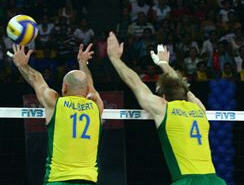 They block by taking a small step to the left or right to set up the block in front of the hitter. Or to keep it even simpler; outside blockers jump straight up without any steps. Left and right side blocker set up the location for the block - and middle blocker comes in to form a double block. The second style is simpler and technically much easier for the left side and right side blockers. Usually beginners use this second style. Important tip! Generally speaking the correct timing is to jump right after the hitter has jumped into air. Keep your eyes open when the ball is spiked. If you keep your eyes open and first observe where the hitter's body is facing and how hitter's arm/shoulder turns - and secondly move your eyes on the ball at the last moment, you start getting blocks. Some blockers find success when they try to push their arms over the net as late as possible. Or they change the arm position in the air. Best hitters are able to see your arms and pass you, so it could be beneficial placing your arms up at the last moment. Quite often players tend to be TOO close to the net when blocking. You may think it doesn't make any sense, but it is true that staying a little bit off the net increases the number of blocks. Why? How far player should be off the net when blocking in volleyball? Players often go as close to the net as possible because it helps shorter players to reach higher - and not to block the ball to the own side. This is a little bit complicated issue because shorter players may not have any options, but to stay very close to the net. Let us explain.. Shorter players may have to have their arms pointing straight up in order to reach over the net. If their hands are pointing straight up, they have to be very close to the net, otherwise the ball will fall between the blocker and the net. Often short players focus so much on getting higher that they ignore the most important thing, penetration. Important Tip! Exception. Short blocker may choose to "soft block" by bending the wrist backwards and trying to slow the balls for the defenders. In the picture: Soft Block. For taller players it is beneficial to stay little bit further out because it helps to push the arms further into the other side of the net. Why Volleyball Blockers Need to Penetrate? When penetrating to the other side of the net, the player is able to cover more own court. The further you penetrate, the less court the hitter sees. Penetration also helps to put the ball straight down. If the player gets only the wrists over the net, penetration with the arms really doesn’t help the blocker, it actually decreases the height of the block – but the player needs to remember to bend the wrists to put the ball down. Ball is Hitting Your Forearms? If the player is able to get forearms about half way over the net, player needs to penetrate arms and push the hands toward the ball, otherwise the ball may hit the forearms. In order to block the ball down, it is important to reach further to the other side - not higher. If you stand TOO close to the net, you can’t push your arms/hands far enough into the opponent's side.